One last go at the WTO, and then I promise to get back to, um, writing things you all want to read about. Accounts of the WTO invariably stress the comprehensive, global nature of the institution. Mentions of a “global trade deal” and the body’s “149 member countries” pepper newspaper accounts. The WTO itself likes to stress its encompassing nature, which tends to give rise to some grandiloquent, sometimes apocalyptic rhetoric in favor or against the organization. This whole discourse, while technically accurate, is actually quite misleading. It is true that, in some formal legal sense, WTO negotiations cover all trade topics for all 149 member countries. But, in practice, the impasse is over a quite limited number of highly protected products. In most markets, tariffs are already too low to have a really serious impact on the pattern or volume of trade. This is especially true of industrial products: manufacturing tariffs average less than 3% worldwide. Only in textiles and clothing are there a significant number of “tariff peaks” that seriously distort trade. 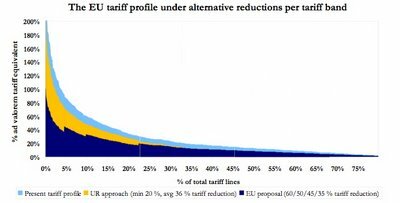 Elsewhere, tariffs are so low they barely register in producers’ or consumers’ decisions. The really bitter disputes, the ones leading to deadlock, are over the treatment of a handful of coddled products. Tariffs on rice, milk, and sugar make up a startlingly large chunk of the impasse. In a way, the unending deadlock is over rice pudding – arroz con leche – the world’s most distorted dessert. The three things you need to make yourself a nice arroz con leche, together with a handful of other products (bananas, cotton, beef, chicken meat, and tobacco) make up a very small proportion of world trade, but account for a very large proportion of the rents generated by protectionist trade policies. This explains why economic models simulating the impact of a new WTO deal usually predict relatively small welfare gains – around 0.15 to 0.4% of global GDP. In fact, most markets are already liberalized in most countries, so the additional impact from liberalizing the handful of holdouts is not very big. The concentration of tariff peaks around just a few products also explains why agreement has been so hard to reach. The current system concentrates the benefits from protection on a tiny, cohesive group of farmers who find it highly profitable to organize themselves into lobbies in order to defend their rents. Those lobbies, lavishly funded and very well organized, come to dominate their countries’ trade policy stances. In effect, the less you negotiate about, the harder it is to agree.